The team at MyCERT has released ElasticSearch honeyPot (ESPot) as a tool to capture every attempts to exploit CVE-2014-3120. This tool is written in NodeJS and released under General Public License v3. Kindly refer here to get ESPot and the configuration instructions. 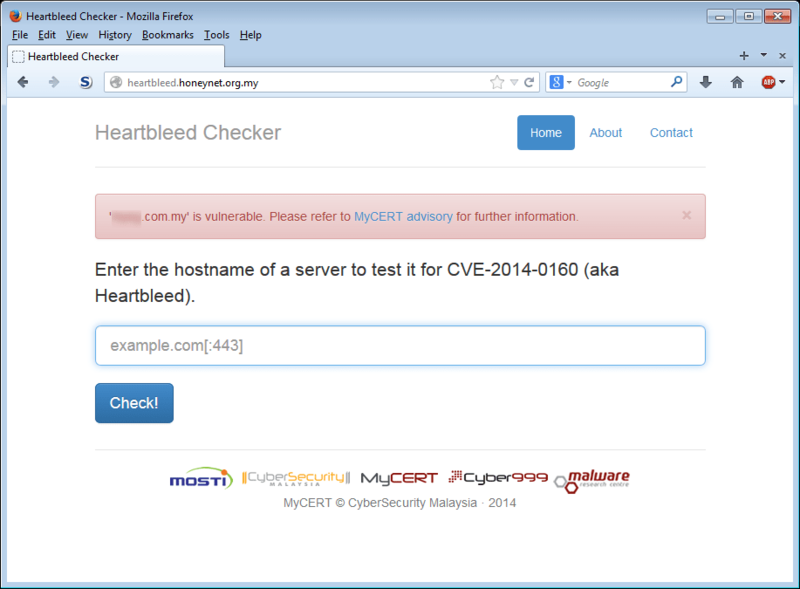 Heartbleed checker hosted on honeynet.org.my. Showing an example of vulnerable website detected. If you find any bugs or error in this web service please do not hesitate to contact us or leave a comment. The sample has been reported to have C&C capability which is using unusual top level domain name (.onion). This TLD is usually used by TOR. 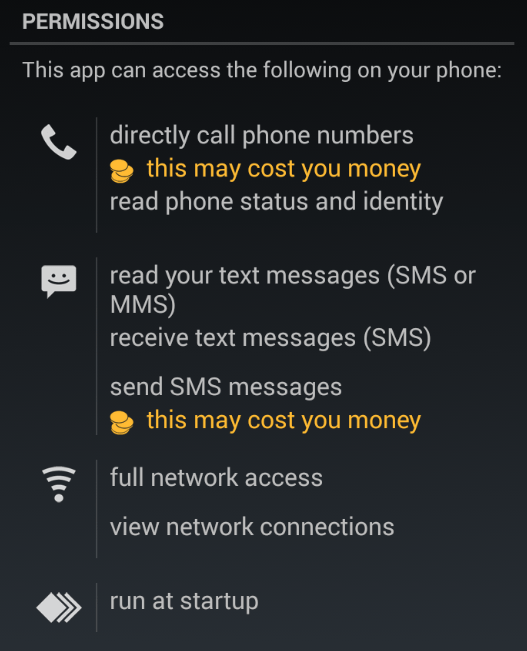 We have discovered more functionality which is not just TOR but also taking advantage on SMS, contact, USSD, and listing installed apps. There is about 300 network addresses listed in the .htaccess file and makes other anti-phishing researchers think that site does not exit. On another note, do make use of our DontPhishMe plugin for Firefox and Chrome! For challenge 6 of our series (provided by Mahmud Ab Rahman and Ahmad Azizan Idris from the Malaysia Honeynet Project Chapter) we present you with a pcap file that contains network traffic generated by the following scenario: An unsuspecting user opens a compromised web page, which redirects the user’s web browser to a URL of a malicious PDF file. As the PDF plug-in of the browser opens the PDF, the unpatched version of Adobe Acrobat Reader is exploited and, as a result, downloads and silently installs malware on the user’s machine. Software development in the security domains always involve converting from and to hex and binary format. For those new to certain languages, a high learning curve is involved and this translates to increasing the development cost. This article concentrates in using the ruby language to help new comers shorten the learning curve. Please note that there is a new line character (\n) between C and D. Table 1.0 contains the same variable presented in 4 different formats. When we store ‘A’ character into a variable, it needs to be placed in memory. Since our RAM can only store 1 and 0, the ‘A’ character needs to be converted to this binary format. Base on ASCII table (http://www.asciitable.com/) it is agreed that the ‘A’ character should have 01000001 which is equal to 65 in decimal. From the ASCII table, a new line character will be stored as 00001010 in RAM which is equal to 10(decimal). Now we are ready for the next phase which is to convert the data into ruby language. First we will look at how to convert hex to binary. pack() is a method for array object. Originally sHex is a string, so we need to put it in the block to convert it to array. Pack method will produce a BinaryString. The ‘H*’ directive will tell ruby that the array element is a Hex string. There are many directives available (http://ruby-doc.org/core/classes/Array.html#M002222). For converting BinaryString to hex, we should use unpack with H* as the format parameter. The result is quite long. To understand it, split the string so that each group has 8 numbers. This is because each character consumes 8 bit in memory. “41”.class is a String. This means our memory will store “00110100” (decimal =52, hex = 34) and “00110001”( decimal = 49, hex = 31). “41”.hex.class is a FixNum. “41”.hex will tell ruby to read those string as hex, as a result stores “01000001” (decimal = 65, hex = 41) in memory. The two examples will definitely be interpreted differently by a CPU. To display the same value in binary we can use to_s(2) method from the Fixnum class. The result is a string which contains a binary representative of 0x41. Value 2 for the parameter means to display the value in base 2. Sending 16 as base will output the same result “41”, as hex is base 16. You can try to pass any integer between 2 and 36 and study the output for further exercise. pack(‘B*’) method from Array class will process the first element of the array and present it in BinaryString. Always remember, that machines do store information in streams of 0 and 1. Since human have limitations in memorizing long numbers, hex representation is used which can still represent the same value. On Sunday, the 28th of November 2010 around 20:00 UTC the main distribution server of the ProFTPD project was compromised. The attackers most likely used an unpatched security issue in the FTP daemon to gain access to the server and used their privileges to replace the source files for ProFTPD 1.3.3c with a version which contained a backdoor. The fact that the server acted as the main FTP site for the ProFTPD project (ftp.proftpd.org), as well as the rsync distribution server (rsync.proftpd.org) for all ProFTPD mirror servers means that anyone who downloaded ProFTPD 1.3.3c from one of the official mirrors from 2010-11-28 to 2010-12-02 will most likely be affected by the problem. plant a backdoor that will enable him to escalate to root privileges on the proftpd installed server. The first attempt done was changing the configure file and adding the tests.c file in the tests directory. The attacker added 4 lines in the configure file as shown below. Figure 2 is a snippet from tests.c showing that the program will connect to 212.x.y.z on port 9090 and send the string “GET /AB HTTP/1.0\r\n\r\n” which is a Get method for the HTTP protocol. This will tell the attacker which IP is using the compromised source code and might be a potential victim. For the second payload, the attacker has altered the help.c file in the src directory. The above line is added at line 129 in the pr_help_add_response function. This line of code will be executed when ftp client sends HELP ACIDBITCHEZ to the vulnerable proftpd even without user authentication. It will then run /bin/sh or /sbin/sh and give the shell to the attacker with root privileges. Figure 3 shows the vulnerable ftpd giving root privileges to an unauthenticated user. Users are strongly advised to make sure they are not using the compromised program. Below are the md5sum of the source tarball for version 1.3.3c. I was playing with a piece of malware with Jun Yee and we came across an obfuscated string in the VB code. The malware itself was written in Microsoft Visual Basic 6. 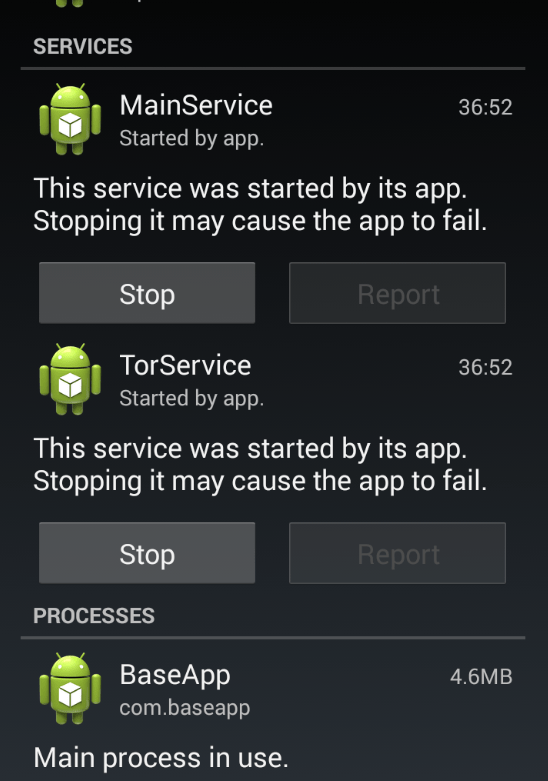 It has a feature that allows the malware to overwrite itself after execution just to make it a bit stealthier. Additionally, the virus itself contains an obfuscated string . Thanks to Jun Yi for helping me decrypt it faster.